This Patch the Pirate adventure is not only “cool”–it’s downright freezing! 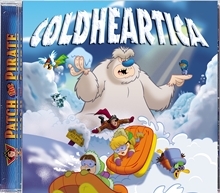 When Faren Height enlists Captain Patch and the crew to rescue her brother Celsius before his graduation from Ice Cool, Klondike the penguin and Zero the polar bear are there to help. But will that be enough when Captain Patch and his crew face the evil Jack Frost and his fearsome henchman, the Bomb-N-Nibble No-man?